So...what did I do? I sat down and cried and thought,"How am I ever going to turn this into the classroom of my dreams?" Then off I went to my first new teacher orientation. I came back to my bare classroom and noticed a handwritten note on my desk, which read,"From confusion comes wisdom!" (Confucius) Well...that did not really help much because I felt confused and overwhelmed the whole entire year. Instead I thought, "Confucius has never been a first grade teacher so what does he know???" But actually he did know something...in fact...he was absolutely correct from my confusion and lack of having time to organize correctly, I learned a ton and I was never, ever disorganized again during my entire teaching career. So, I would like to share with you a few important organizational "take aways" from my first year that stuck with me my entire career...with a few tweaks here and there! 1. Always make a list of what you want to do or change, what worked, what didn't work and what you need to get together before school starts. My first year I was not able to do this and I felt like I was playing catch up the entire year! It really doesn't matter if you have to change things up a bit during the school year. If you find that something is not working for your class, change it. That is OK! Remember each class is different and as teachers we have to adapt to the needs of our students. One year I changed my desk location about 6 times before the first trimester ended. The kids had so much fun trying to guess where my desk was going to show up the next time they walked through the classroom doors. It was like a scavenger hunt! Here is a checklist I created to help you in your organizational journey! Checklist of What you Might Want to Have Ready or Think about Before School Starts... It's on Teacher's Notebook, too! 2. Make sure your classroom supplies are organized before your kiddos come bouncing through the door that first day. I am not saying that everything has to be in an obsessive order nor does your room have to look like a Pinterest promotion., but let's make sure that it does not look chaotic and cluttered. 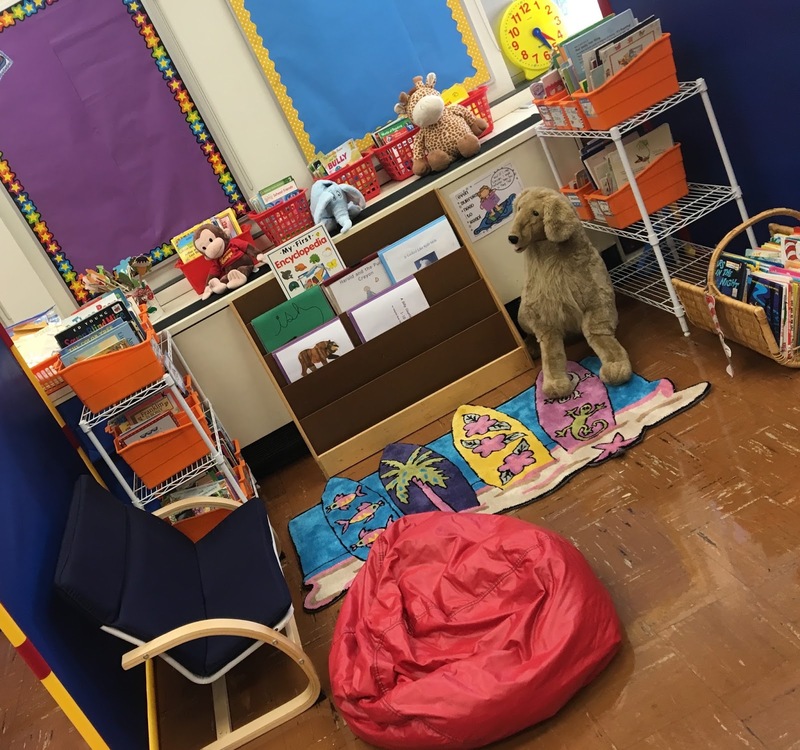 You need to leave some things for you and your class to do together so they feel welcome and take ownership of the classroom. I am talking about supply and material organization. Where do the pencils, erasers, paperclips and markers go? These need to be ready and available without rooting through the piles of "stuff" in various places. For this reason, I always labeled EVERYTHING! I put all these items in shoeboxes or baskets with labels and categorized accordingly. 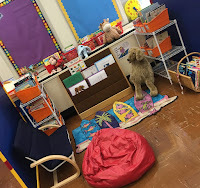 There was a space or place for everything: games, supplies of all shapes and sizes, Guided Reading materials...you get the idea. I always added a label with a picture and word, which is two-fold; first, you can easily see where the supply is located and second, the room is labeled for emergent readers to read the room! 3. 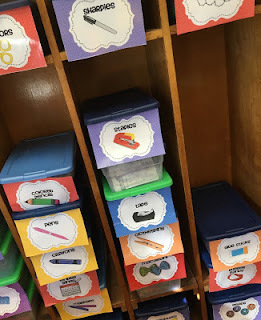 How about those closets, shelves, math supplies, Phonics' games and all the "things" you need to get to quickly for a lesson or even when an idea pops into your head and you need a manipulative quickly as well as when your colleague sends a child with a note that says,"Do you have the Telling Time Bingo Game? Can you send it with Johnny?" These need to be ready and available without rooting through piles of "stuff" in various places or thinking, "I just saw that somewhere...now where was it?" on shelves or in a closet. These are math baskets before the labels were added! Then cover the shelves with these colorful tablecloths. The tablecloths are simply hung from a tension rod and tacked so you can lift them up and grab what you need and doesn't it look a bit clean and organized? I think I heard...YES!!! 4. Next up...organize your reading books or classroom library "nook." Over the years, I have used different spaces for a reading area, but there is one common thread. 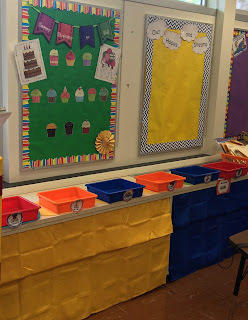 All of the books are in bins or baskets and organized into specific categories that meet the needs of MY STUDENTS. The way you categorize your books can be completed in many different ways or you can use a few different ideas, but it is important that it works for your class. This reading area looks extremely inviting and the kids love to read and work in it. To the left and right of the tables on the white shelves were the classroom library books, which were arranged and labeled in this way; ABC's, numbers, colors, easy readers, chapter books, specific popular authors, general nonfiction, animals, space, biographies, Dr. Seuss, insects, weather, seasons as well as popular book characters like Arthur, Clifford and other popular book characters. This worked best for my first graders because they had favorite topics and authors they enjoyed reading about over and over gain. 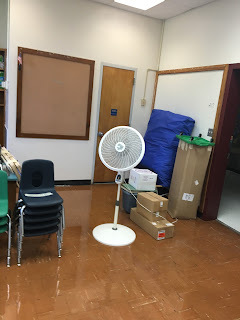 FYI: The designated classroom "Helpers" cleaned this area up at the end of the day and this is a product of their great independent organizational skills. The Shelves behind the table under our"reading buddies," housed our NightlyReading Books that the students took home each night to read. 5. Room organization is one thing, but thinking about communicating with parents can also be classified as something important that you need to have organized and ready to use the first day of school. If a problem arrises, who wants to be shuffling through papers and looking for parent contact information...NOT ME...It is better to be proactive and ready! It is also important to think about how you want to communicate with parents and keep an open positive line of communication between home and school. There are plenty of apps out there created for parent communication, but not all schools are ready to use apps. To keep this at bay, it is important to have a Parent Communication Log that houses all important information about each child and their caretakers. This one binder can be a life saver as you talk and chat with parents, you can print out e-mails, 3 hole punch them and keep all of these for future reference. It can also be a place to jot down notes and reminders about conversations and dates these took place. Newsletters are also a way to stay organized and keep the lines of communication open. These weekly or monthly newsletters will keep you organized as you think back on the week or next steps in your lesson planning. Parents LOVE hearing about what is happening or going to happen in their child's classroom. These can be completed in a digital or written format. Getting these ideas organized at the beginning of the school year will help you stay focussed and be present in your daily teaching life. Here are three resources that support parent communication and will keep you calm and ready to go! I know I have only given you about 5 organizational ideas to start the school year off on the right foot and there are so many more, but as long as you have these 5 ideas and organizational strategies in place, you will be less stressed and have the best school year yet! BTW: Did you notice a common thread throughout? Labels, binders, checklists, containers and baskets...you can never have enough! Have a great year and don't forget to ORGANIZE!!! PS: Here is a link to some other resources you might like! I love all of your ideas! Thanks for the links to your freebies! That's awesome! Thanks for stopping by! Enjoy the freebies and have a great year! Helpful tips and tricks! I have started labeling more things this year and I am LOVING it!! Organization is super important and needed for the kids! Great post! Megan- Thanks for stopping by and have a great year and stay organized!! Thanks for sharing, you have so many great tips! Thanks for stopping by. Have a great year! !